4100 S. Martin Luther King, Jr. Blvd. 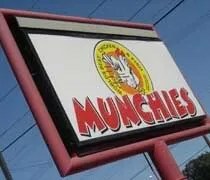 Munchies on MLK in Lansing. 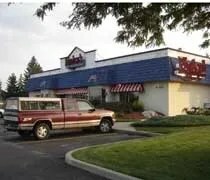 Serving up the "Cheapest Wings in Town....Period!" A few weeks ago I had to run to the Walgreens on MLK instead of the one I usually go to on Cedar. As I’m driving down MLK, a small restaurant with a big banner out front catches my eye. A lot of times, you’ll see stuff like “Best Wings in Town” or something similar boasting about the taste. Not this banner. It read “Cheapest Wings in Town.” There’s something to be proud of….I guess. When I got home, I told J about it. She looked at me a little funny and said I was on my own for that one. If all they can advertise is the cheapest wings in town, she wanted no part of it. 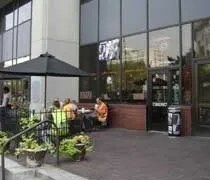 Finley's American Restaurant on S. Cedar St in Lansing. I was bad. I got home from Indianapolis at 4 AM after leaving Lansing at 7 AM the previous today. I was a little tired. Phone calls woke me up and I only got about six hours of sleep. After my girlfriend went to work, I decided to take a nap. Usually when I take afternoon naps, I sleep for an hour or so. Not today. I slept almost three hours. I woke up about ten minutes before J usually comes home for dinner. There was no way I could put anything together in that time other than a salad, so I swallowed my pride and sent her a text message letting her know there would be no dinner ready in time. She called me back and said we could just go out, but she wanted to go to a restaurant where she wouldn’t be tempted to order something greasy. I got to admit, I was surprised when I got an e-mail asking if I was available to shoot a Colts vs. Bengals preseason game at the brand new Lucas Oil Stadium in Indianapolis. I do a lot of college football, but I’ve never done professional football. After thinking about it for three seconds, I realized football was football and I would not only get some NFL football to put on the resume, but I’d get to check out the new stadium. Lucas Oil Stadium sits right across the street from the RCA Dome which is in the process of being demolished. The new stadium is huge. The footprint for the RCA Dome sits on seven acres. The footprint for Lucas Oil sits on 13 acres. Even from the outside, the stadium is impressive and a huge improvement. The RCA Dome looks like a generic basketball arena. Lucas Oil looks more like Conseco Fieldhouse. I kind of surprised myself with this one. I went to a cafe for lunch and my girlfriend wasn’t even with me. 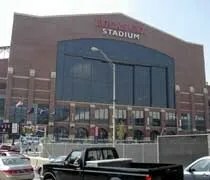 I was in Indianapolis to work a Colts game at Lucas Oil Stadium. I got to Indy about an hour before my call time, so I decided to look around for lunch. 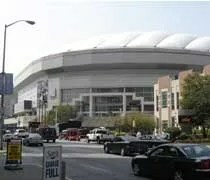 I parked in a garage across from the RCA Dome and went for a walk in the immediate area hoping to find a sandwich shop or something quick. I didn’t really know where I was going once I got to the Stadium, so I didn’t want to cut it too close. After walking around about 10 minutes, I ended up back at the garage where I parked. Right next to the door I came out of was a little cafe called Ah Barista. If you’ve been following along, you know Pepsi is my weakness. I’m not the healthiest eater in the world, but my biggest problem with weight gain since college has been Pepsi. I got in a bad habit of drinking out of a 2-liter whenever I got thirsty instead of drinking water. Well, it’s time to lose the weight. I’ve been fairly inactive this summer but have managed to keep my weight steady. I’m not gaining or losing, but I’d much rather be losing. In order to do that, the four to five cans of Pepsi a day need to stop. I’ve tried Diet Pepsi and Diet Coke. Both taste like crap. I’ve tried mixing Pepsi with Diet Pepsi. That sorta worked, but I don’t want to open both a can of Diet and regular whenever I need a fix. The other day I was in Kroger and I was walking buy the single serve cases near the check-out. I started to grab a Diet Coke to see if I could stomach that. My brother swears it’s better than Pepsi. As I started to reach, another bottle caught my eye. 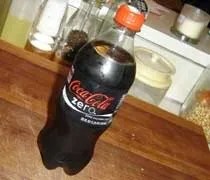 Coke Zero. I’ve seen the commercials but never paid attention because I prefer Pepsi to Coke, but I picked it up to read the label. Zero calories! Like a diet pop they use aspartame to sweeten the drink instead of HFCS. Why not give it a shot. I can handle regular Coke so if the commercials are true, this could be the solution to my problems. I got home and took a drink. YAY! It works! It doesn’t have that bitter after taste that Diet does. It tastes like Cola, so until Pepsi comes out with a competitor, it looks like I’m going to have to switch over to the dark side and start drinking Coke. It looks like I picked the right time to give up Pepsi. A few years ago and I would have been stuck drinking Diet. If you’ve ever looked at my sidebar, you’ve noticed I have RSS feeds from the local media outlets here in town. This story on WLAJ.com really jumped out at me today. 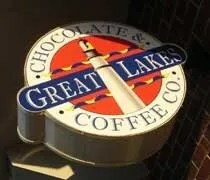 About a dozen mid-Michigan workers are employed today with the help of the Great Lakes Chocolate and Coffee Company. YAY! Chocolate! When my girlfriend came home for dinner tonight, I suggested making a run downtown to get a couple pieces of gourmet chocolate for dessert before I took she had to go back. I had heard about a little bar in New Buffalo that may have the best hamburgers in the state. In fact, I read that in a book at Barnes and Noble. I don’t remember the name of the book, but the premise was the best hamburgers in each state. In Michigan, there was Blimpy Burger in Ann Arbor (review HERE), Red Coat Tavern in Royal Oak (review HERE) another place I don’t remember and Redamak’s Tavern in New Buffalo. 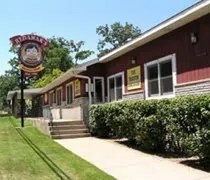 For quite some time now, I’ve been wanting to stop at Redamak’s on our way home from Chicago. After a three day weekend at my parents in Iroquois County, we finally got the chance, but not before a brief stop at Lighthouse Place Premium Outlets in Michigan City, IN.